Dual Threat Pre-Workout and Fat Burner! Energy, Focus & Improved Strength! Fat Burning Capabilities! While John Meadows’ new Granite creation does sound like quite a complex supplement, it is surprisingly simple. 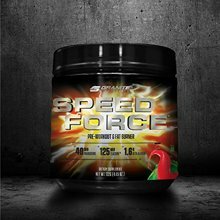 Speed Force features a relatively short combination of just five commonly used ingredients to help increase energy and focus, improve strength, and burn fat. The list of ingredients Granite has pulled together for its new hybrid pre-workout Speed Force include the performance enhancer beta-alanine at 1.6g per serving and 250mg of the classic stimulant caffeine. You then have 125mg of pure TeaCrine to further enhance the product’s energy, as well as 125mg of Sensoril ashwagandha and 40mg of the fat burner Paradoxine grains of paradise.